Ever since Jesus Christ gave the command: “Go into all the world and preach the gospel,” barriers have been encountered in the proclamation of the Good News. Efforts to reach Canada’s First Peoples have certainly not been exempt from obstructions. Large distances over formidable territory, scattered populations, linguistic and racial barriers have all made the Church’s task difficult. How thrilling to see television helping to overcome these obstacles! 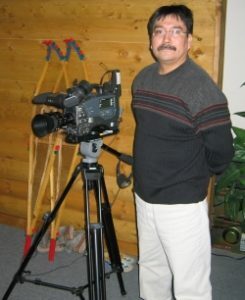 In 1982 NCEM began telecasting the half-hour program, Tribal Trails, which continues to bring the Gospel to thousands of First Nations homes across the country each week. In the late 1970s God implanted a vision in the hearts of NCEM leaders for a television outreach. They believed that the message of God’s love and forgiveness through Jesus Christ must be proclaimed in a culturally sensitive way to as many Native people in Canada as possible. In 1980, missionaries Derrick & Jean Hiscox and two Native Bible school graduates formed the first NCEM-TV staff. At first people were skeptical. Would TV really be an effective outreach? Wouldn’t the cost be prohibitive? One of the initial goals, to broadcast nation-wide by satellite, seemed out of reach. God blessed these initial efforts. Within three years, eight more workers joined the team. By 1983 the program was being aired on stations in seven provinces. That same year a new studio/office facility was built. In 1986 Tribal Trails began airing on ITV, a satellite station, and has since expanded to several satellite stations to reach thousands of communities coast to coast to coast. There is potential for millions in North America to be watching, with some stations indicating that more people view Tribal Trails than other religious programs. And through the Internet the program can be seen worldwide. Tribal Trails was never intended to replace the personal ministry of the resident church planting missionary. But television does have unique advantages. Through TV the Gospel is presented to people who would not normally welcome a personal visit nor attend a church meeting. And it reaches into many more homes than would be physically possible for missionaries, pastors and evangelists to visit. Tribal Trails has become a “door-opener” — the missionary who identifies himself with the program often finds that he and his message have already been introduced to the people. Tribal Trails has even opened the way for missionaries to settle in new communities. In addition to telecasts, Tribal Trails DVD recordings have proven to be an effective ministry tool. Those who appear on camera are Native Christians sharing what Christ has done for them. The majority of NCEM-TV’s staff work behind the scenes, giving opportunity for First Nations believers from various walks of life to share their thoughts and experiences. Through testimonies, songs and interviews, the program’s guests are effective communicators. Tribal Trails is primarily evangelistic in nature, making the Gospel message plain, but it is also an “encourager.” Native believers who tune in find that they are not alone in their faith — that there are increasing numbers of Christians like themselves. The Mission believed then, and still believes today that Tribal Trails is an outreach approved by God. It continues to be a faith-stretching venture. The cost for airing the program on satellite and other stations is presently about $12,000 per week. It is the gifts of God’s people concerned for reaching Canada’s First Peoples that has allowed the ministry to continue. All donations go directly to air time and production costs. Each staff member is responsible for raising his or her own financial support. Perhaps God is directing you to become involved as a partner in this ministry. The prayers of informed Christian friends are needed in order to make this outreach effective. God may be prompting you to support Tribal Trails financially. You may wish to send a one-time gift, or commit to regular giving. If you would like to know more about us, we are happy to send you the Tribal Trails newsletter (mailed free of charge 2 or 3 times a year).